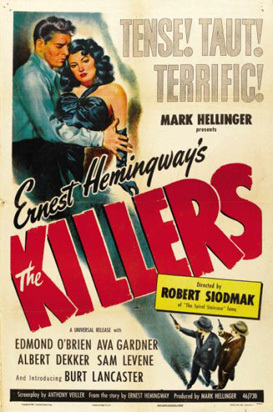 Could film get any more noir than The Killers? Surely a more fatale femme than Ava Gardener’s Kitty Collins would be hard to find. And as for her victim, Burt Lancaster’s ‘The Swede’ has got it coming to him from the get go. But when he leave $25,000 to an unassuming landlady in his will, private insurance investigator Jim Reardon (Edmond O’Brien) must figure out why. Aided in his enquiries by Lieutenant Sam Lubinsky (Sam Levine), Jim gradually unravels the story in recreated flashbacks with the requisite elongated shadows cast far and wide. In the first of these, The Swede is systematically demolished in a major boxing tournament then abandoned by his management to find another career. Falling in with some shady types he takes his devoted girlfriend Lilly (Virginia Christine) to a party hosted by the boss. But when his eyes alight on hostess Kitty he becomes fixated and Lilly realises she’s lost his heart to this immeasurably glamorous woman. Gardner sure knew how to find her light, even when Lancaster, in his first screen role, obscured it she would step back in to the soft glow and highlight her best angle. 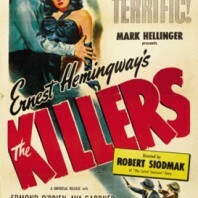 The Killers is the first screen adaptation of ‘A Man Alone’, a short hard-boiled tale from the pen of Ernest Hemingway. It was nominated for four Oscars and comes to us now in a double bill with the lurid 1964 remake starring Lee Marvin, John Cassavetes, Angie Dickinson and a very creepy Ronald Reagan as crime boss Jack Browning. The original draws some long bows with crucial evidence pouring from the mouth of a deranged and dying gangster. But it’s all in keeping with the genre and a specific time and place in cinema history when too much high drama and overblown musical accompaniment was never quite enough.